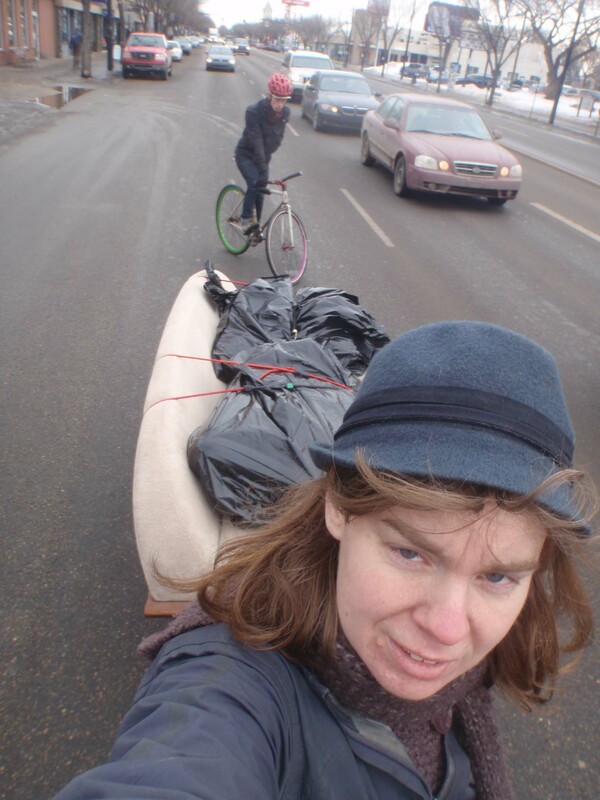 Living car free can pose a challenge when it comes to moving big heavy stuff. Actually, even living with a car still won’t help you move a couch. For a job like that, you need a truck, or an appropriate bike trailer. Nice parallel parking job, eh? 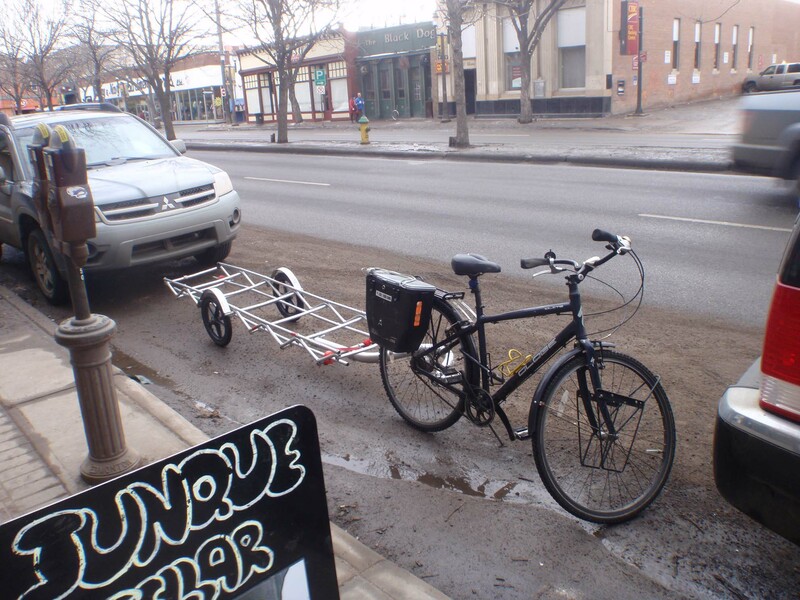 Luckily, you can rent an 8 foot long cargo trailer from EBC. 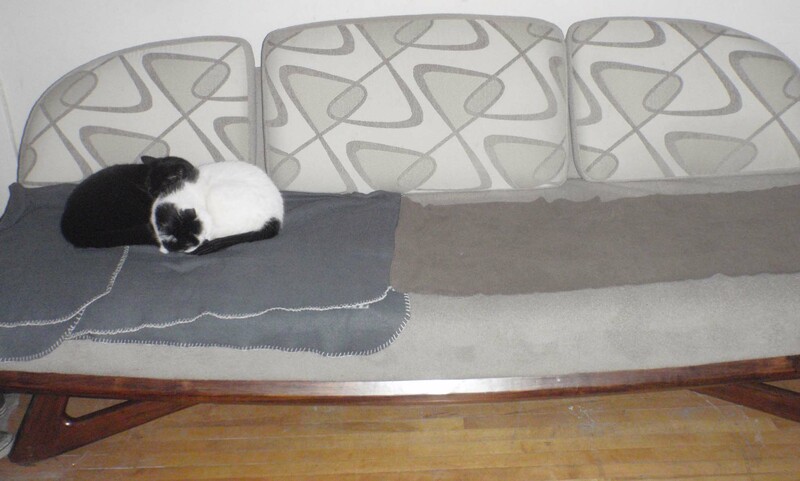 Also, luckily, there was a break in the winter weather the week the bf bought the couch. This is how you move a couch. 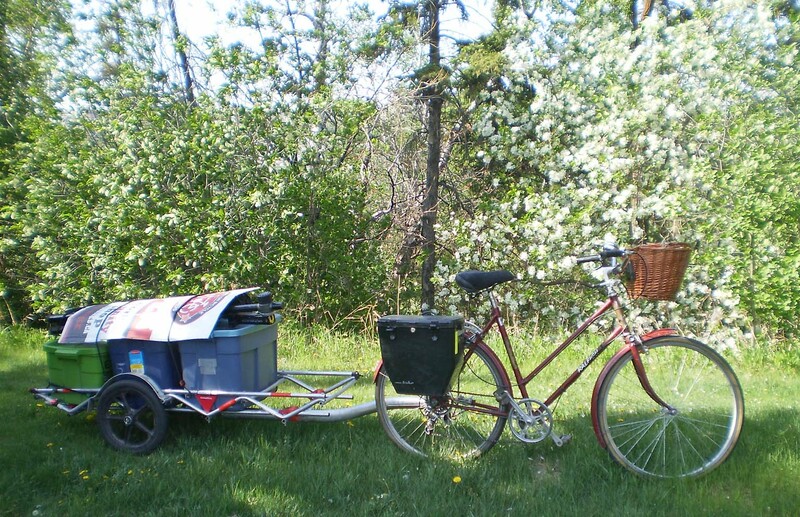 Always place the center of gravity over the trailer wheels, and use a tonne of bungees. I’m a truck rollin’ down Whyte Ave! The hardest part of the day was carrying the couch up the stairs from the basement shop where we bought it. 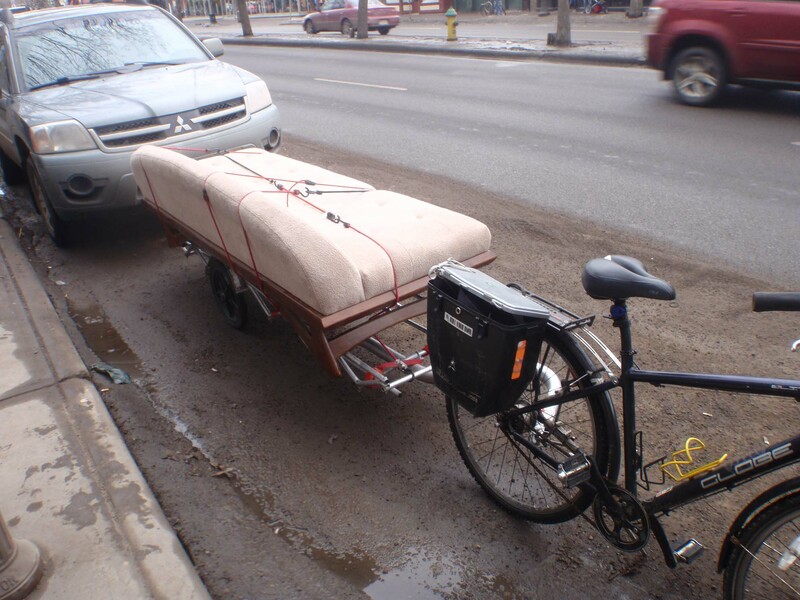 Hauling it by bike was a breeze, though when you’re pulling a large piece of furniture on a bike trailer, you discover your seemingly flat neighbourhood isn’t so flat after all. The residents settle in on the new furniture. Post script: it took less than a week for the two legged, two wheeled residents to get bike grease on the couch. Luckily, a solution of washing soda got it out. Sodium carbonate FTW! It’s obvious why any cyclist would be excited with the arrival of warmer weather (though it’s snowing again as I write this, but it’s a warm snow storm). Spring is doubly sweet for me because I finally get to deploy the Sustain SU bikes that I’ve been working on all winter. The Sustain SU Bike Library lends out bikes to U of A students & staff for a month at a time, and nobody ever walks away sad after getting a bike with only a $40 deposit. The bike library after a crazy busy rental day. I wanted to get a picture of the whole fleet, but I didn’t have time before half of them went out the door. Oh well, with such a small space I can only pull so many bikes off their hangers at any given time, even after I’ve cleared out all the scrap rubber & metal. 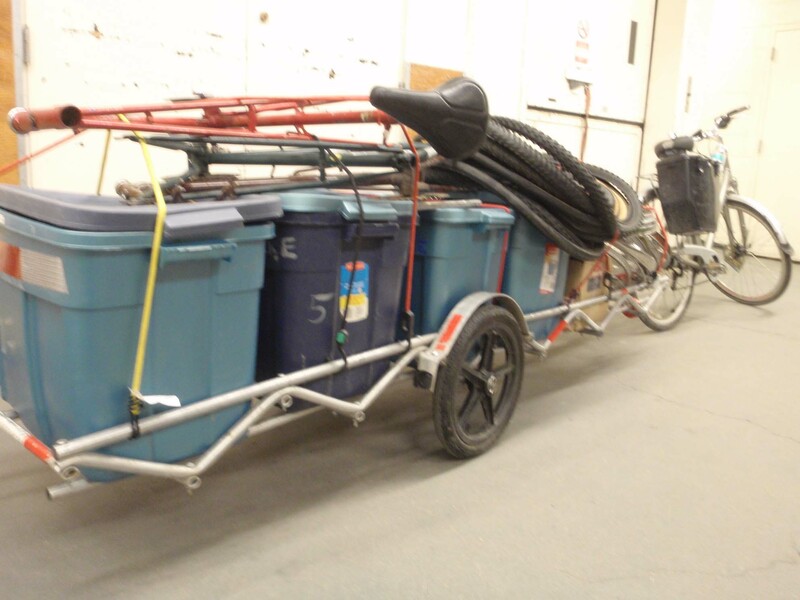 A season's worth of scrap metal & rubber: three bins of rubber, one of metal, a box of cables & housing, and a bunch more wheels, tires & frames on top, all headed off via bicycle power for recycling. I'm a truck. This is what I was up to when I broke my fender stay. 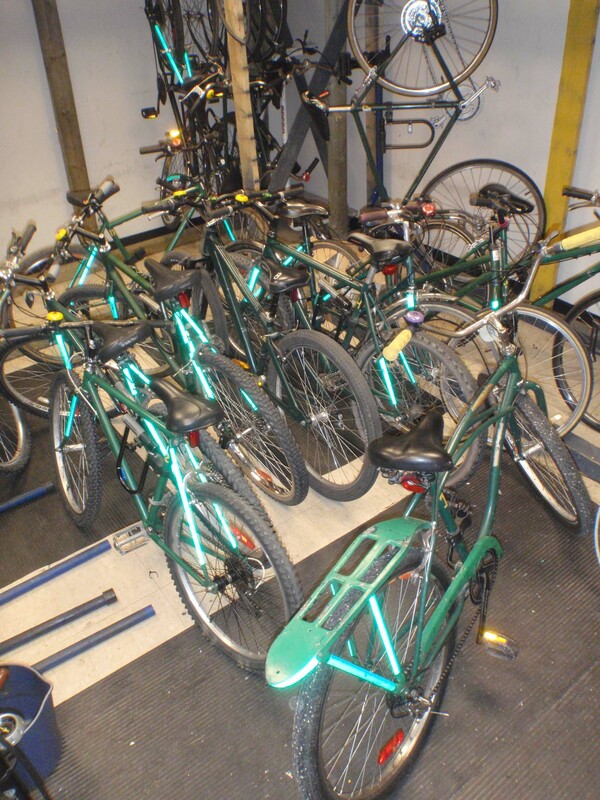 While I’ve been turning wrenches and generating scrap rubber, the Campus Sustainability Volunteers have been working on profiling all the bikes for Plenty of Bikes, our new approach to matching people with bicycles. And now (drumroll please! ), I’m proud to share the brand new Plenty of Bikes video! I cannot understate how giddy this makes me. The volunteers did a fantastic job! I have been working what seems like a tonne of events all over the city with Edmonton Bicycle Commuters lately, doing free mechanical checks on bikes. Sometimes, this also involves getting all the tools, stands, signs, supplies and propaganda to the site on an EBC trailer. Marjory is easily up to the task of hauling 50 pounds on a 5 foot trailer. Now that it’s Bike Month, the frenetic pace of events has increased for everybody associated with the utilitarian cycling scene in E-town, scenes like the one above will be repeated almost daily. Meanwhile, to thank Marjory for all her hard work, I’ve got her a special treat: a set of white wall Schwalbe Delta Cruisers. Pictures coming soon!